Maison Touareg – the Moroccan and Lebanese restaurant in Soho, celebrated a quasi-birthday/relaunch the other week. The Greek Street restaurant has been around for 25 years and wanted to acknowledge this landmark, plus Maison Touareg also had a bit of a rejig 18 months ago and so what better way to celebrate than by throwing a North African and Middle Eastern feast? 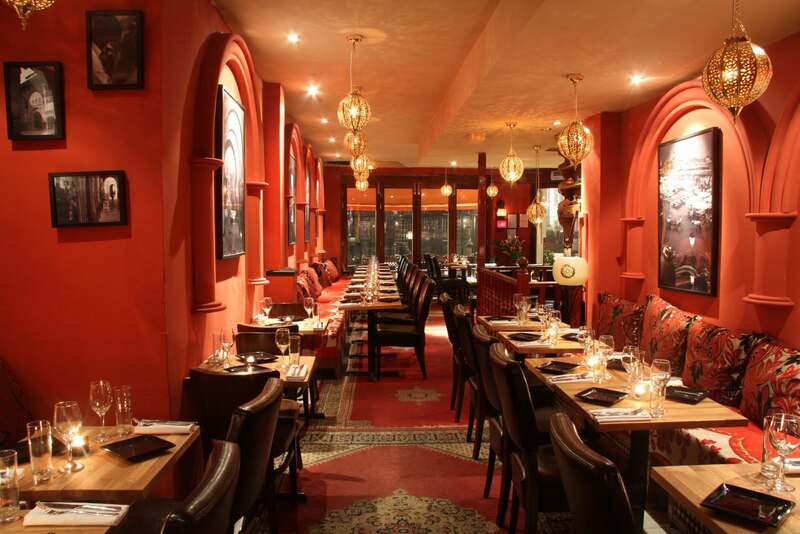 Although Maison Touareg describes itself as a Lebanese and Moroccan restaurant, aside from shisha pipes outside and meze - including baba ganoush, halloumi, merguez sausages and falafel – the feel of the restaurant and the dishes is distinctly more Moroccan. But hey, if calling Maison Touareg Lebanese means houmous stays on the menu, why not? Not wanting to leave its customers hungry, the restaurant then served up a gourmet buffet of Meshwi, a whole shoulder of lamb slow-cooked with apricots and figs so that it had a sticky pull-apart texture, plus, not one, but three tagines; chicken with preserved lemons, beef and a fantastic fresh fish tagine, which was my favourite dish of the eve. By this point my friend and I felt like our bellies had been inflated with a tyre pump. It was therefore a little disconcerting to see that, beneath her wrap-around dress/dressing gown, the lady behind me in the queue for food was in full belly dancing regalia. Moments after chowing down on Meshwi, she was baring her abs to the whole restaurant floor. Time to go back to aerobatone, thought I. 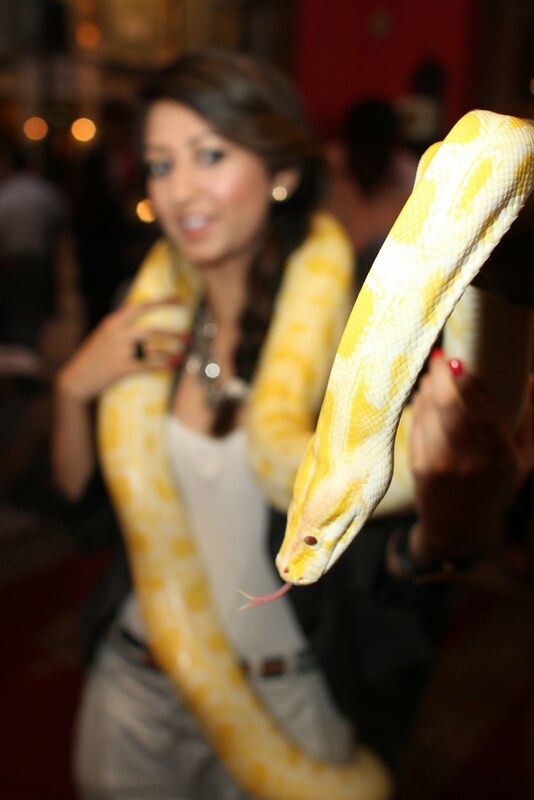 Another belly dancer arrived with a pale yellow-skinned snake draped across her shoulders. Apparently, the restaurant rolls out this act on a regular basis and while it gathered a crowd, for me, it’s a bit gimmicky, a la Greek plate smashing. My friend, on the other hand, displayed no such snobbery. She used to have a pet snake and helpfully informed me that it’s a constrictor snake because it was fat and therefore able to stop its prey breathing with its strength. Said friend also convinced me a snake’s skin feels nice and encouraged me to touch it. I did for a nanosecond, and promptly decided it really didn’t. This discovery means that, alongside my fear of fish and dislike of pigeons, I now hate snakes. Although on a perverse plus note, at least they are dangerous. James Herriott, I am not. After thoroughly washing my hands with a dash of belai black soap - a Moroccan soap with the texture of butter and beautifully infused - I gained enough composure to finish off the night with some baclava. My friend and I are even thinking of grabbing a cheap deal to Marrakech. Failing that, a night at Maison Touareg Restaurant will satisfy the desire for the exotic. Worth Its Weight In Michelin Stars?